I’ve been grocery shopping since I was a teenager. As my mom’s real estate career took off and she had to work late at times, my dad, my sister and I became very domestic. Dad learned to cook, I started reading cookbooks, and Katherine and I did all the shopping. When my dad decided to teach himself to cook, he went all out. He didn’t have any interest in making french toast for supper or making a killer spaghetti and meatballs. No, he decided to cook the dishes he likes to order in a restaurant, so it was Veal Oscar and Lamb Chops with Pesto Cream for us! He also came up with some dishes, and my sister and I made the list for those meals and all the other stuff in between. Armed with that list and a blank check, we’d hit the Irmo Winn Dixie and shop away. Interestingly enough, even though we had a blank check with us, we became meticulous label readers and comparison shoppers. Each week we would come home and unload all the bags onto the counter so we could visually survey just how much we’d been able to buy for “our” money. I can’t put into words how valuable and educational this experience was for us. And it carried us into, and has remained with us through, our adulthood. Just the other day, I saw just how much that experience had taught me. I needed cayenne pepper. As I often do, I stood in front of the spice area in the store and started scanning the shelves from top to bottom. I’ve known for a long time now that this is an area of HUGE profit in the grocery biz. Most people arrive at the spices, spot what they need, conveniently right at eye level, pick it up, toss it in the basket and off they go. NO! BACK UP! YOU’RE DOING IT WRONG! That’s exactly what “they” want you to do! Packaged herbs and spices are one of the biggest rackets in the grocery industry. If you’ve ever grown herbs yourself, you know how little it costs. Most major grocery chains have their own private label, which I truly believe, comes from the same place as the brand name spices. For the most part, they carry the usual suspects (basil, oregano, sage, garlic powder, etc.) and some of the more interesting and special herbs and spices. 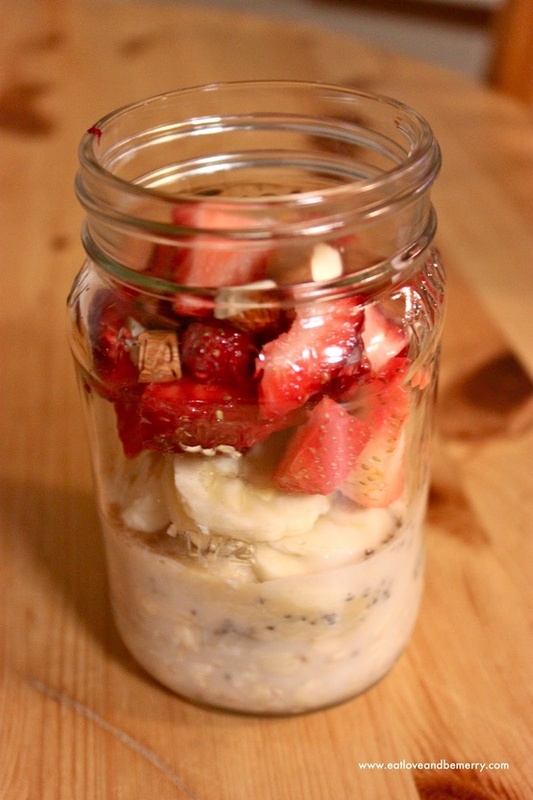 Then, there are the pretty little glass jars that attract most people’s attention. They look much prettier than the grocery store brand, and they are much more interesting than the old school ones that are still in the little metal canisters that we all remember from the 60’s & 70’s. I imagine it being like that scene in “Finding Nemo” when Marlin & Dory happen across the spooky, terrifying fish with the hypnotic light on the end of its antennae…it’s so pretty. So, most folks see the pretty little bottles, grab that cayenne and continue on without a second thought. If you continue scanning those shelves, like I did the other day, you may find some pleasant surprises. In this case, I wanted cayenne pepper. The little glass jar of pepper (at eye level) was $4.49. 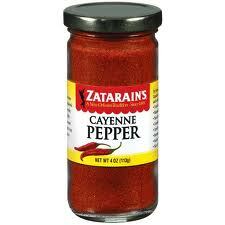 Just one shelf down (about hip level) was Zatarain’s cayenne for $1.49. Same number of ounces, same ingredient, different shelf, dramatically different price. See, that’s what “they” are banking on. They have studied our nature and know that most people will spot what they seek, grab it and go. But, seriously, a $3.00 difference? It’s simple robbery on the spice route! Look one shelf down and you’ll encounter the special blends such as Cajun spice, blackening spice, or Creole spice. The price tag is offensive to me. Read the label and you’ll probably find that you have all those spices at home in your cabinet right now. You don’t need a sketch of Prudhomme on the label to make it authentic. But, the advertising and marketing geniuses are betting that you either don’t know this or are too lazy to mix up your own stuff. Ok, I have one concession to this rant. Maybe you (I, we, they) are simply too busy or just not inclined to spend this time or attention to this matter. No big deal. Do your own thing, ride your own ride. But, if you’re like me most of the time, you want to find the true value, the true deal and spend an honest buck. If that’s you, devote about 5-10 minutes to really check out your grocery store’s herb/spice aisle. You may be surprised and enlightened by what you discover. When one of my fellow Zumba instructors told me that Celebrity Cruise Lines was working with Zumba Fitness to book instructors for their cruises, I jumped at the opportunity. After a strenuous audition process, I was thrilled to be offered a gig on the Celebrity Summit! They first offered me a position on a 2-week cruise but I had to turn them down. There was no way I could be away from my kids for that long. Fortunately, they offered me a week-long cruise that I was able to schedule. I have to admit, I was very nervous since I did not know what to expect. Every ship’s Cruise Director and Activities Manager do things a little differently, plus the number of classes you teach usually depends on the number of days the ship is at port and at sea. Needless to say, it was quite the adventure and I just had to be prepared to do my thing! 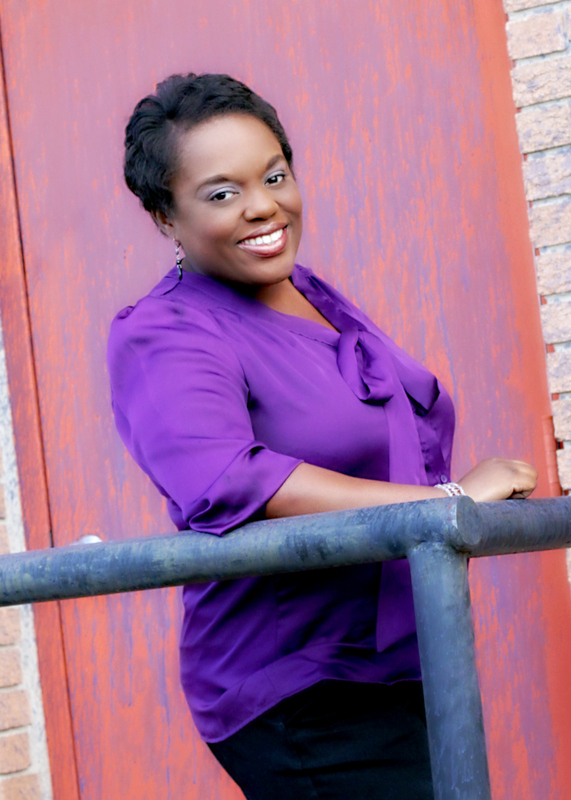 I am so glad that I took the plunge and accepted the job because it ended up being such an amazing experience. On my first night on the ship, I met with Manuel, the Activities Manager, who filled me in on the schedule and then interviewed me on-camera. The interview played on the main ship channel on all the TVs in each room and around the ship. 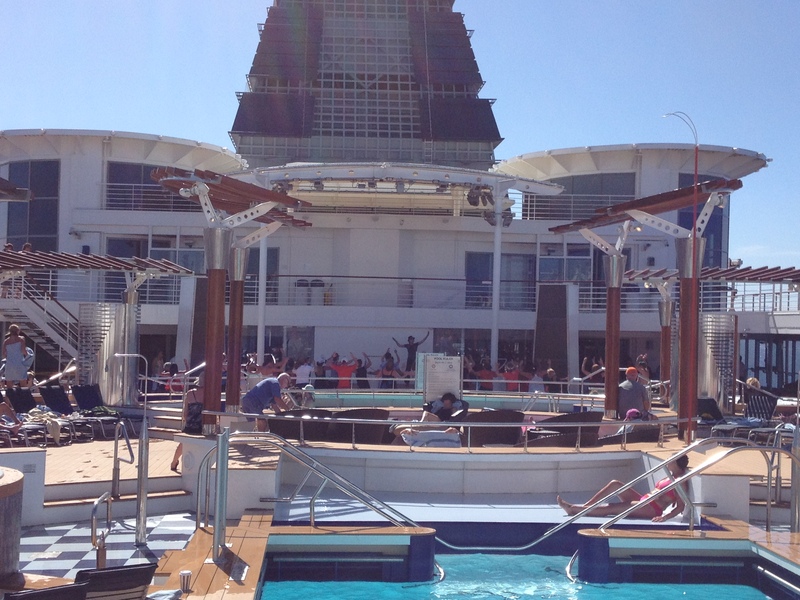 All of my classes were on the main pool deck’s stage – the stage of the open sea! Some folks would show up in their work out clothes ready to Zumba and other folks would see all the fun we were having and join in from the pool, the bars and the dining areas. Each class was like performing a show! If people weren’t dancing, they were watching from the pool, the balconies, etc., and some were even taking pictures. Of course, it helps that everyone on a cruise ship is on vacation and, therefore, in party mode! The air was always electric with happiness and fun. The one thing it took some getting used was the ship’s movement; when a ship is at sea, it moves and sways A LOT. Attempting to dance on a moving object took some getting used to. In some of my video footage from my classes, you can see the water in the pool dramatically sloshing back and forth. Dancing on a rockin’ ship certainly presents a challenge for the muscles and your equilibrium. Such a weird feeling! It took me days after returning home to get over the occasional sensation of being on a moving object. The funny thing is that before I taught my first class, the crew kept warning me about the Caribbean heat. Shoot! That Caribbean heat was nothing compared to the heat of the indoor pools where I teach Aqua Zumba back home! Yes, the sun on the ship was hot, but the wind of the sea was glorious! I discovered very quickly that I had to wear a hat when I taught to keep my hair from whipping around like crazy, but it felt great and kept me cool enough that I didn’t walk away dripping sweat after each class. When I teach Aqua Zumba, I don’t get the privilege of getting in the water; I have to teach from the side of the pool and those indoor pool rooms are like steam bath saunas! Once I start dancing, I’m usually literally dripping sweat by the 2nd or 3rd song, and I’m not even a big sweater! When I walk away from teaching an Aqua Zumba class, my clothes are wet with sweat and I look like a red-faced, stinky mess. When I first started teaching Aqua Zumba it took me months to condition my body to teaching in that environment. But goodness do I love it – regardless of the heat, I have so much fun teaching it that I get over the sweaty part. 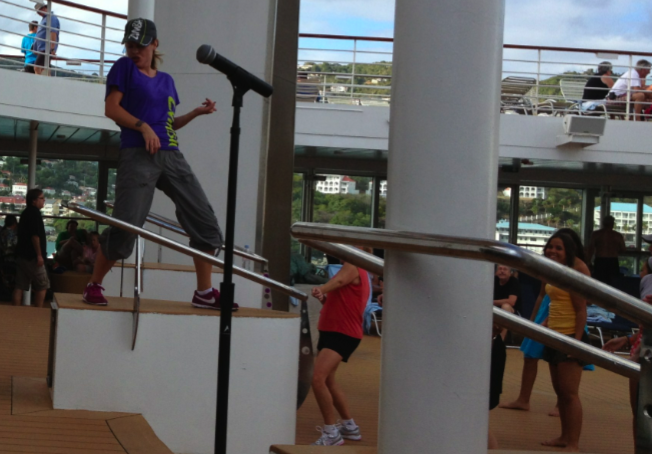 So my point here – teaching Zumba on the deck of a ship was the ultimate experience. I could handle those conditions any day. It would be such a privilege to serve as a Zumba instructor on another cruise! I really hope I get the opportunity to do something like this again. It was such a blessing to meet and dance with so many fabulous people from across the world. And it definitely was an honor to represent Zumba and to work with the incredible Celebrity crew. What an awesome cruise line. They definitely made me feel like a celebrity! I think if sour cream had a different name my husband would like it a little better. It isn’t doing itself any favors by masquerading as something delicious gone rancid. My husband just doesn’t like it. At all. It is forever hidden in the back of the fridge even when recently purchased, and I only secretly add it to recipes he’ll be eating. I lie. He LOVES sour cream…when he doesn’t know about it. The same sort of story goes for lentils. So they make somewhat frequent appearances on our dinner table. Long story short: he thinks he hates both items until he takes a bite, and then he loves them both. Mushrooms? I’d be risking our marriage if I served those. I don’t.even.go.there. When I whipped up a dish containing a delicious trifecta of sour cream, lentils AND mushrooms, it goes without saying that my husband was not even in the same state as me. This dish is so good. 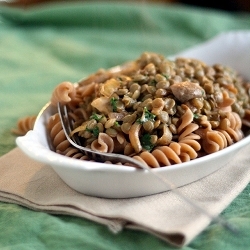 It includes the two meatiest vegetarian entities to replace red meat in a stroganoff that will leave any eater, vegetarian or not, feeling ultra satisfied. Bring a large pot of water to a boil. Add the lentils and cook, covered, for about 20 minutes. 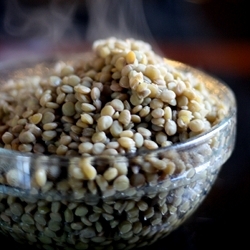 Drain and rinse the lentils and set aside. Heat the olive oil in a wide skillet over medium high. Add the onion and cook until soft, about 5 minutes. Add garlic and turn heat to low. Cook 2-3 minutes. Add the mushrooms, paprika, and a few pinches of salt. Cook, stirring occasionally, another 5 minutes, until the mushrooms are browning and soft. Stir in the lentils, parsley, and vinegar and cook, stirring, for a few minutes. Stir in the sour cream, cooking just until heated through. Taste and adjust seasonings, then serve over pasta or rice.